A young woman named Hannah (Rachel Hendrix) suffers from a variety of ailments. Now in her college years, she is also struggling to fit into normal life after years of home schooling and sheltering parents. Though beautiful and talented, her handicap continues to have a grip on her, causing her collapse onstage at her school’s play. Along with her physical ailments she struggles with depression and loneliness. As her struggles continue to come to light she finally is confronted with the truth that her ailments are the effects from a premature birth caused by a failed abortion. Overwhelmed with emotion, Hannah struggles to come to grasp her new known reality. With confusion settling in, Hannah turns to long time friend Jason (Jason Burkey) who convinces her to join him and a few goofy friends on a spring break trip. Along the way a side stop in Hannah’s birth place is planned. Jason cares for Hannah and wishes to help her discover who her biological mother is. However, he must battle his own girlfriend and Hannah’s father who aren’t fond of Jason’s gestures towards Hannah. The trip provides a spiritual journey into the value of life and forgiveness for those who suffer. October baby is one of the better directly pro-life movies that have been made. The movie does well to show the correct emotional responses of the individuals affected by their choices in their respective states of life. It is also a beautiful shot film and does not suffer from a bad script or overwhelming comic relief. However, the progress of the film is not as consistent as it should be. Much of this reason lies in the flaws of the film which are evident to even the simplest perspectives. Steven Greydanus does well in pointing out some of the more obvious flaws in his review. There is an almost complete disappearance of her ailments just after the first fifteen minutes of the film. Her illnesses are later linked with her premature birth from the failed abortion. The viewer hears all about her hip surgeries to her struggles with depression. However, after the first fifteen minutes, the reality expressed in the film does not convey this. Hannah seems to go about as a completely normal person with little display of her ailments. 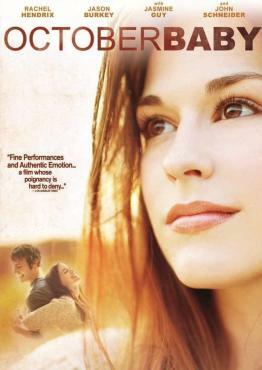 One of the bigger disappointments of the movie is the development of Hannah and Jason’s relationship. The movie establishes from the beginning they have been friends since childhood. Now in the beginning of their college years, Jason is described (but not really shown) as one of the more popular guys in school. The only real display of this is in his preppy blonde girlfriend who could easy be identified with dating the stereotypical “most popular guy in school.” The contrast between who Jason dates and who he calls his friends remains confusing. Perhaps Jason is caught up in his image and is able to date a very attractive young woman. However, none of his guy friends could say the same. I ask myself this question, why is Jason dating Danielle? It’s my assumption to say Jason is caught up in his image or possibly the looks of his girlfriend, but the film really never shows that weakness in him. He is a very likable guy with very down to earth friends. The film, also, does not allow even an ounce of likeability to his girlfriend. Not only is she unlikable but overwhelmingly so. Danielle’s conversation with Hannah in the hotel room is a set up to allow the audience to sympathize with the fact that Jason leaves her and his friends to help Hannah find her biological mother. The problem is that the sub plot of Jason having an irritable girlfriend on a road trip with college friends is unnecessary. There is a lack of development with Hannah and Jason because there is really no development. Even though Jason is dating Danielle, he is easily in love with Hannah from the start. There is little about Hannah’s character that leaves anyone from finding her very attractive. She is very beautiful and very graceful about herself. It seems very odd that no other guys had interest in her until Jason, but with her home schooling past, her depression and protective parents, it is possible. The movie, in my mind, would have done much better to leave out the character of Danielle and just to let the friendship of Jason and Hannah develop naturally into a romantic one. There was no sense in alienating Danielle for this gain. Her parents seem to want to keep Hannah’s past a secret from her, yet decide to let her scared past be brought up in a doctor’s office? Certainly they knew her ailments were a cause of her premature birth. They also continue to keep their cards close to their chest, but after Hannah is picked up by her father after meeting her biological mother, what need is there for any more secrecy? The fact that they went bankrupt has little to do with Hannah and her life going forward. The fact they had a miscarriage should not affect Hannah as well. It seems that they are merely overprotective for no really logical reasons. Then they exhibit an extremely non protective stance in letting her go off with a bunch of college age boys on a trip to Mardi Gras. In first glance, there is absolutely nothing wrong with this statement. The film correctly shows the intrigue with the Catholic Church when it comes to the supernatural. Many films, Catholic or not, realize the sense of the divine in the Church and the pre-modern church buildings. Films convey this for all sorts of spiritual healing, whether it is from an exorcism to repentance and forgiveness. However, the “ecumenical character” can go no further. Steven may bite his tongue if the statement was reversed and a Catholic was visiting a Baptist Church with a Baptist preacher. Ecumenism can only help those come closer to Christ in the true faith and not to simply highlight commonality. So this should make the hypothetical reverse situation a bit unsettling for Catholics. What I find to be the strongest message of the film is the message of forgiveness. There was an obvious romantic feeling building between Jason and Hannah; however what would have been expected, for most, in the reunion with Hannah and her mother, did not happen. Hannah’s biological mother initially shows coldness to the fact that Hannah survived the failed abortion but not even flinching when Hannah recites the date back to her. Then after coming to a realization of just exactly who she had in her office, she initially seems to be willing to talk but then being put on the spot to explain who Hannah is resorts to a feeling that she is utterly embarrassed about her decision. She writes off Hannah and leaves with her husband and child, literally putting Hannah in her rear view mirror. With her life now where Hannah’s mother envisioned it, she refuses to relive her afterthought, even though it is her own daughter. I could see many being surprised by this response, anticipating a triumphant ending, but unfortunately this would be far from reality. Unlike the incredibly naive understanding of human emotion in the film Courageous, October Baby depicts what is true. As a young adult, we begin to grasp who we are and where we come from. We take sides and truly start defining ourselves. To us, it makes sense that our mother or father would jump at the chance of reconciling. This, however, is not reality. For our parents not to know us, or attempt to know us, for our lifetime is a clear indication they are, in fact, broken individuals. No matter what the cause, revisiting these experiences for them may be nearly unbearable. They have probably committed the last couple decades to forgetting. They have moved on with their lives and it is a cold reality. Even though Hannah’s mother appears to come to grips with the situation later, she no doubt will continue to keep her distance from the situation. The film relives a message that her life is a lie. This is far from the truth. Hannah does have a loving mother and father and they are her parents. She is who she is and the fact that she survived a failed abortion is only a small portion of her life now. She continues to live with the sin of her mother as her ailments persist, but she is a smart, talented and beautiful young woman who has a good life. Emotionally, the understanding of your parent not wanting you can haunt you for the rest of your life, but it is a choice to let it weaken your spirit or to strength it. God will bestow the grace to forgive; we just have to accept it. Hannah has forgiven and now her life is open to unlimited promise. Despite the flaws of the film, the strongest message that it tried to send was a success. However, the film will unlikely attract many who are not already convicted about the immorality of abortion. The Grand Jury Prize as the Best Fiction Feature at the 2011 Red Rock Film Festival. Can you expand on your comment on Courageous? I just saw it about a month ago and actually liked it, but I’d like to hear your comments on its portrayal of human emotion. I sent you an email. I will attempt my own review in the near future.